Through white blossoms and emerging spring greenery, a rectangular metal banner attached to a streetlight pole on Capitol Way peeks out. 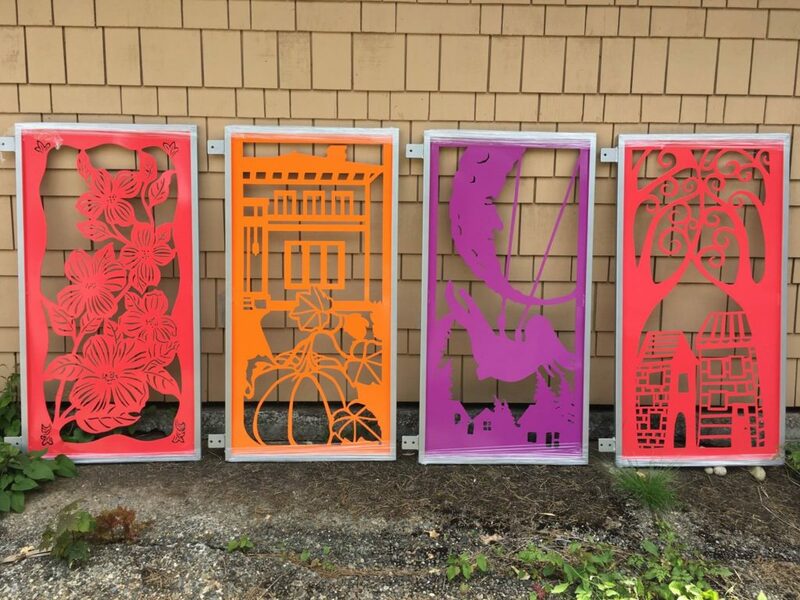 A stroll down the historic Olympia street that passes through the South Capitol neighborhood will reveal six such banners, all the same size and shape, with varying colors, each with a distinct cut-out piece of art. Each banner represents a unique story, a specific moment in time and was designed to evoke a specific feeling from the viewer. Gathered round a dining room table in the home of Rachel Newmann, neighbors and artists converse about the neighborhood banner project. Newmann is president of the South Capitol Neighborhood Association (SCNA). 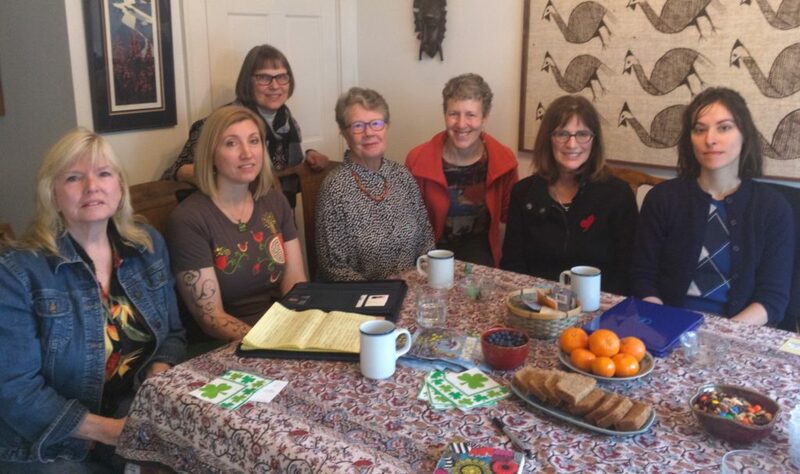 Also in attendance are Peggy Clifford, former SCNA president and current liaison between the SCNA and the City of Olympia, and Kris Tucker, neighbor and member of the art selection committee and a diverse group of banner artists. Newmann, Tucker and Clifford discuss the steps it took to bring the art from idea to reality. Laughter fills the room as Newmann points out that they thought the project would be simple, taking only a few months. The process was anything but simple; however, after years of work, the South Capitol Neighborhood is proud to display six original works of art that should last for years to come. The banner project began as a collaboration between the SCNA and artist Jack Mackie in 2013. The SCNA wanted something that would differentiate the neighborhood from the adjacent Capitol Campus. Mackie helped the SCNA develop concept art and refine their ideas into what became the banner project. At one point, the idea of cloth banners was tossed around, but the SCNA felt that cloth banners would not offer the longevity they desired from the art. The decision was made to use powder coated aluminum. Initially, only two banners were commissioned, using funds from the City of Olympia Neighborhood Matching Grant program. In 2016, the SCNA applied for and received another grant which would expand the banners to a total of six and add matching borders around all the banners to make the them more visible. Clifford says that it was important to the SCNA to use local artists and fabricators for all the work. Once the artists were selected by a committee of five from the SCNA, they worked closely with the fabricators to ensure that important specifications were met. Artists had to ensure that the cutouts had good attachment points to the edges of the piece, as well as had enough cutout space for air to flow through so wind would not damage the art. Mimi Williams, a printmaker, and creator of “Blooming Dogwood” says that it was a challenge to take her detailed print piece and simplify it for the metal cutting all while adding in enough airspace to match the fabricators recommendations. “Coming Home” by Jennifer Kuhns is the northernmost banner and the first one that people see as they head out of the Capitol Campus and into the South Capitol Neighborhood. Kuhns moved to the area in 1988 and traveled up and down Capitol Way often. She states, “Driving into the neighborhood was an aesthetically enjoyable experience. There is a sense of comfort in the way the trees branch over the road.” Kuhns sought to recreate that with her piece, which shows two trees arching over homes. Creator of “Solitude,” artist Doyle Fanning says she sought to capture the small moment you feel when you look up at the moon through the trees. She points out that three of the six pieces feature the moon, indicating that there is something universal about how the moon seems to speak to us personally. To see all the pieces, drive or walk south on Capitol Way S. from the intersection at 15th Avenue SW. Follow Capitol Way S until it curves and becomes Capitol Boulevard SE. The final banner is at the intersection of Capitol Boulevard SE and Washington Street SE. There are plans for two more banners, pending city approval. Several members of the group discussed that they would like to see banners that look farther back into the history of the area perhaps 150 years ago or more. If the two banners receive final approval from the city, a call to artists will go out through the City Arts Commission Arts Digest email later this spring. 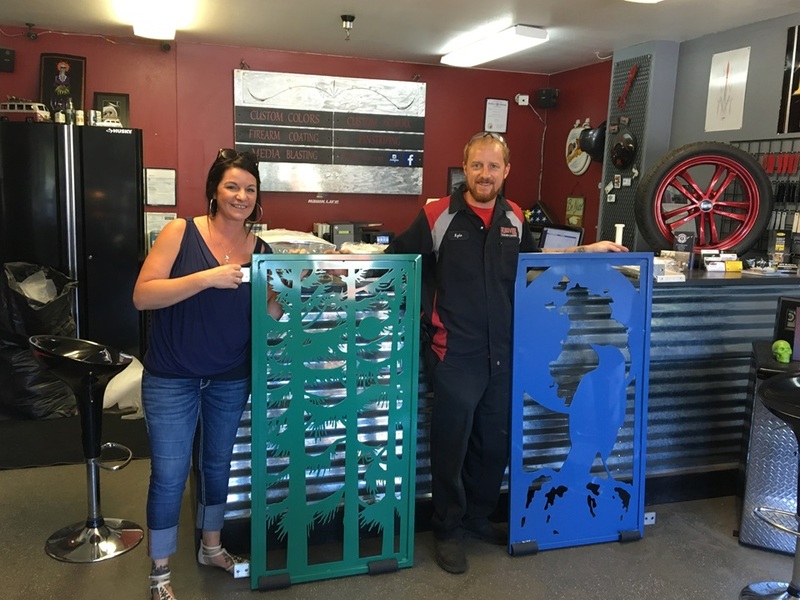 The South Capitol Neighborhood Association would like to thank Da Vinci’s Workshop, Ziegler’s Welding, Forever Powder Coating B & B Sign Co, City of Olympia Public Works and the City of Olympia Arts Commission for making this project possible. To see more art by a couple of these local artists, plan to attend Spring Arts Walk where Veta Bakhtina and Jennifer Kuhns will both be presenting their work at Hot Toddy.